Enjoy your interior, you deserve it! The Wolfgang Cockpit Clean & Protect Kit is designed for those who enjoy not just driving, but wrapping their fingers around the steering wheel and piloting their automobile down the road. The interior of a car is a high wear environment, subject to dirt, stains, grime, and abrasion. The Wolfgang Cockpit Clean & Protect Kit gently cleans your interior surfaces. Then protects the components with an advanced polymer sealant which maintains their original beauty and feel. Slide behind the wheel, fire up the engine, and enjoy your automobile the way it was designed. Wolfgang Leather Care Cleaner 16 oz. Wolfgang Leather Care Cleaner is a pH balanced, biodegradable leather cleaner that relies on natural citrus to lift dirt and oils out of automotive leathers. Wolfgang Leather Care Cleaner removes stains and oils without drying, leaving your car�s leather looking and feeling like new. Leather Care Cleaner is ideal on most interior surfaces such as vinyl and trim pieces as well. Wolfgang Cockpit Trim Sealant 8 oz. Wolfgang Cockpit Trim Sealant provides your vehicle's interior with unmatched protection. The interior of your vehicle is subject to normal wear and tear due to regular use. The trim can fade, crack, or dry out over time if not properly maintained. Wolfgang Cockpit Trim Sealant coats all of your interior surfaces in an extremely durable polymeric film that resists soiling and sun fade, maintains optimum levels of moisture, and prevents staining. It is ideal for all interior surfaces including carpet, fabric, headliners, upholstery, vinyl, rubber, metal & wood trim, and premium and fine grain leathers. The All Purpose Microfiber Towel makes interior cleaning a breeze. The fine nap design lifts dust, dirt, and grime without scratching or damaging interior surfaces. The soft microfiber nap will not scratch or dull paint, so it is perfect when used on delicate surfaces such as Piano Black trim and Carbon Fiber as well. The Microfiber Applicator features high quality microfiber wrapped around a foam core sponge. The result is an ultra high quality microfiber you grab in your hand and use for all of your detailing needs. The soft microfiber features an extremely large surface area making it perfect for applying or removing waxes, sealants, spray sealants, dressings, and more. The short microfiber fingers also provide excellent scrubbing power for cleaning soiled leather, vinyl, and plastic. The Poly Foam Applicator makes it easy to apply Cockpit Trim Sealant to all interior surfaces. These soft, high-quality, applicator pads lay down extremely thin uniform coats without risk of scratching or dulling. 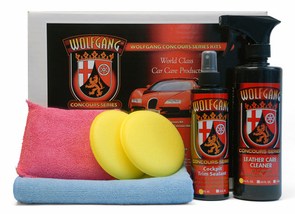 The Wolfgang Cockpit Clean & Protect Kit is the ideal choice for those who cherish the fine engineering of their automobile's interior. There are no harsh cleaners that will damage or dry out delicate materials. There is no oil, silicone, or grease to create a high sheen and synthetic feel. Enjoy your automobile as it was intended to be with the Wolfgang Cockpit Clean & Protect Kit.